Despite Apple’s hard work to resolve all of the device’s issues, the three software updates they’ve released since the device’s initial release almost four (4) months ago, I have continued to have device issues on a daily basis. I continued to have applications crash, both core Apple apps like Mail, iCal and Safari, as well as 3rd party apps…ANY third party app…, and calls drop every day. 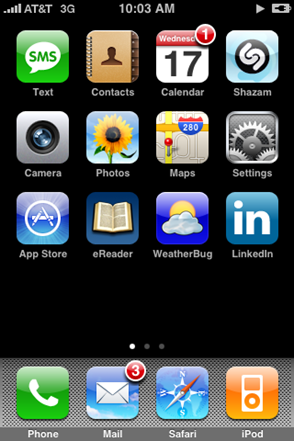 The BNSF rail line that I commute on for 4 hours every day, has some of the worst coverage on the AT&T network in Chicago-land…but only on my iPhone 3G. EVERY other GSM phone I have that carries an AT&T SIM doesn’t have the coverage problems that my iPhone 3G does. I’m actively carrying 3 cell phones right now: the iPhone 3G, the AT&T Tilt, and the Glofiish V900. My Tilt, for example, even with a wacky cooked ROM and non-standard radio, doesn’t have the same problems that my iPhone does. I can’t count on the ferkackta thing to hold any kind of call at any time. My iPhone drops an average of 4 calls a day, and I’ve had it. I was doing the best that I could, and doing ok at it…to ignore or live past the issues I had identified with Exchange and with the device as a business tool (see my articles, links above), and was doing ok with it; but when I was speaking to a very close friend on Friday, and had to deal with 8 separate call drops during the conversation I had to stop before trying to call them back the last time (never hooked back up with them…) and ask myself if I would have stuck it out like this with any other phone? Would I have put up with all of the quirkiness, memory issues, application crashing, and above all, call dropping issues? The answer hit me like a truck – hell no! I would have contacted the device manufacturer, shared my findings and told them I was returning the device. I might just give Stevie J. a call or drop him a line and let him know what is going on. It likely won’t result in anything, and again, I have already sold the phone (it ships out tomorrow, 03-Nov-08). Unfortunately, the device, in my opinion while nice for casual cell phone users, is just NOT ready for prime time with a power user like myself. I depend on my phone too much to put up with the really, reALLY bad performance I’ve been ACTIVELY excusing over the past 4 months. I’ve become way too accommodating, and I really need to be more "me-centric" right now. So, selling the phone took all of, about 10 minutes… and I plan to use the proceeds to purchase a Samsung Epix sometime in the next few days. If it performs anything like the other two Blackjack devices that it resembles, it will be a good choice. If all else fails, I’ve got the Tilt and the V900 to fall back on as backups, in that order. I may consider another iPhone in the future, but not without some serious hands on time and research first. I’m sorry Mr. Jobs…I didn’t sign up to be a beta tester for this device; and for me, in my market, the device just isn’t ready for wide distribution.